I find that I am increasingly wanting to save and view flash files. Maxthon has a plug-in for this but its not that great and when my eldest daughter came to me last night and said she wanted to save a great flash animation of hurricane damage I really struggled to get a copy of it for her. In the end I recorded it as a video using Camtasia Studio and saved that video as flash – talk about overkill, especially as I had to figure out how to make Camtasia v3 work with Vista, which it partially (but frustratingly) does. The end result worked pretty well, but the resulting flash file ran slower than the original and didn’t have any sound. So tonight I decided there must be a better way – and there certainly is. The BrowserTools web site has an excellent set of utilities, one of them lets you right click on the html content of a web site that contains flash content and download it, if this doesn’t work – for example nested flash – then you can quickly go hunt through the cash with its cache browser (easier than it sounds because the cache browser is pretty clever and provides previews, filters etc). 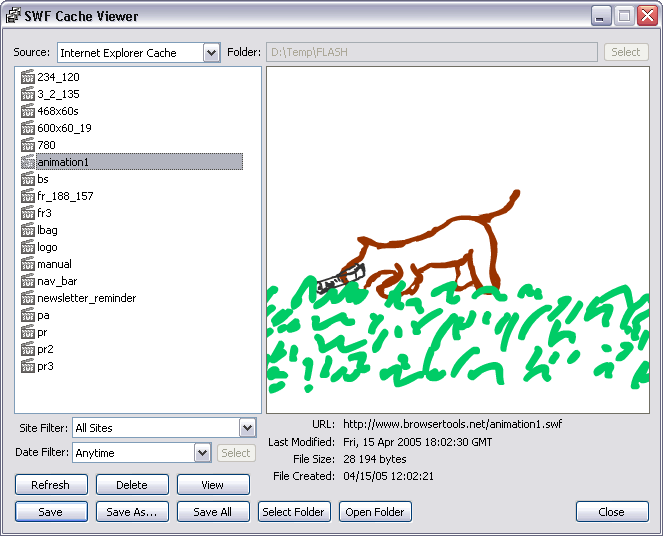 Finally when you get your flash content you can display it directly with the flash viewer. Altogether really excellent. Both seem to work in Vista with Maxthon and Firefox. With IE you get a toolbar as well. As an aside; the Vista programmes search is great, press the Windows key and type flash and it will return all of the programmes relating to flash – that assumes they have flash in their filenames! In this case they are named FLV…, so I dropped a few shortcuts into my startmenu that I renamed to have flash in the name. That way I stand a chance of finding these utilities again. Hey steve, check out http://groups.msn.com/camtasia-vista for the Beta that TechSmith is working on that works with Vista. I’ve got it installed and it’s working pretty good! Please feel free to drop me an email if there’s anything else I can help you with.